The Port Royal New South (1862-1866) offers an interesting perspective on life in the South Carolina lowcountry during the Civil War. 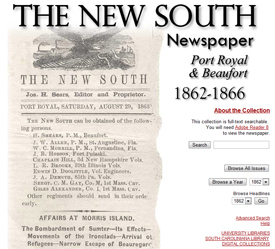 The editors published the first issue of their weekly paper in March 1862, which was several months into the Union’s occupation of Port Royal. While it promised to “abstain from the discussion of exciting political topics,” the paper’s ultimate objective was “to strengthen the hands of the government and those who represent it.” This collection, which is available from the University of South Carolina, requires Adobe Reader in order to view any of the newspapers. A number of other interesting digital projects are also available. This is fascinating. How amazing and uncertain life must have been during the U.S. Civil War. this is interesting because the article is a way to in a way persuade or as stated make the government stronger, it would be interesting to study articles of the time, or their form of media and how they used it to their advantage.